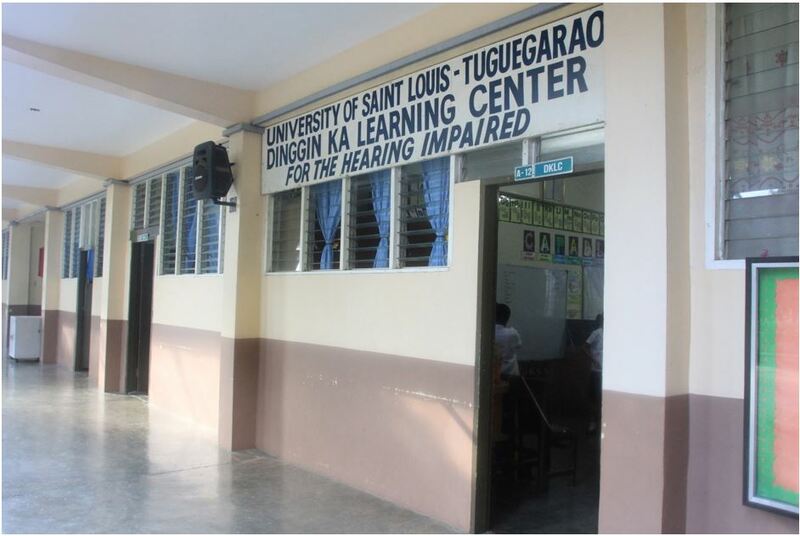 Tuguegarao City – The University’s Dinggin Ka Learning Center (DKLC) turns 20 this year offering kindergarten to sixth grade education for the hearing-challenged or the Deaf. The Center opened on June 1, 1998 with the name “Learning Center for the Hearing and Speech Impaired.” The Center was renamed to its present name in 1999 by Rev. Fr. Renillo H. Sta. Ana, CICM, then chaplain of the Saint Louis College of Tuguegarao (SLCT) and current president of the now University of Saint Louis (USL). Fr. James Desmet, CICM, also a former SLCT chaplain, and Fr. Luke Moortgat, CICM, director of the Catholic Bishops’ Conference of the Philippines’ (CBCP) Catholic Deaf Care (CDC), conceptualized the program and the Center. Fr. Sta. Ana initiated the implementation of the program. The DKLC offers basic education for the hearing-impaired from introductory level to level 6, or kindergarten to grade 6, respectively, in mainstream grade school. The learning competencies being taught are based on the K-12 program. Multigrade teaching is also done in some subjects depending on competencies that need to be reinforced. The Center had only two teachers during its first year of operation: Mrs. Maria Dinky Lim and Mr. Verus Oscar Reyes. Now, it has 7 teachers including Mrs. Lim who also acts as the head. On the Center’s second year, Ms. Rosario Bajan, deceased, was an addition to the faculty. She was sent to Australia for the needed benchmarking with Rotary Rainbow of Tuguegarao as sponsor. She later became the first DKLC head. The Center started off with five introductory level pupils. Presently, there are 18 pupils from introductory level to level 6. DKLC pupils are taught the same subjects as the regular elementary pupils in the University. “Most of the DKLC graduates continue to high school of similar nature such as the New Life School for the Deaf here in Tuguegarao City; Isabela School for the Deaf in Ilagan City, Isabela; Philippine School for the Deaf (PSD) in Pasay City; and some three in Samar. There were likewise those who pursued college in Manila or Laguna,” shared the DKLC head. While Mrs. Lim expressed intention to conduct a tracer study on the DKLC graduates, she said some of the graduates are now professionals. One works as an image annotator in a tech company in Cavite and another is working in Manila. “One of our former pupils was part of the team for the Study Exchange Program when he was in high school in PSD. Another former pupil is now doing well in her studies in Canada,” the DKLC head added. Mrs. Lim also said that the pupils usually join the Tuguegarao City celebration of the National Disability Prevention and Rehabilitation (NDPR), winning in different contested events like poster making and talent showdown. “They also joined the National Paralympics in Manila last April 2016 and in the Division Level athletic competition for school year 2017-2018 and bagged several awards,” said Mrs. Lim. Just this November, eleven (11) of the DKLC pupils joined the Tuguegarao City Meet Special Events (Paralympics), with awards in athletic events. Four of the pupils will advance to the Cagayan Valley Regional Athletic Association (CAVRAA) Meet in February 2019. The late Reverend Father Clement Daelman, CICM, former SLCT chaplain and parish priest of Sta. Rosa de Lima Parish at Annafunan, Tuguegarao during the dedication of the Center, was among the benefactors of the DKLC. His family in Belgium sends financial assistance for the program. Other benefactors include the Rotary Club of Tuguegarao and other in-house benefactors. Currently, tuition fees of the pupils are based on the financial capacity of parents. Aside from this, all the pupils are given free snacks every school day through the nutrition program of the University which is funded by benefactors from USA, Mr. and Mrs. Jozef Goethals. The couple works with Notre Dame Preparatory School in Baltimore, Maryland for the program “Pasta for the Philippines” whose proceeds go to the University’s nutrition program. Said program caters to the nutritional needs of identified Junior High School students and all DKLC pupils. The DKLC pupils also receive gift items from said benefactors. The programs “Assist-a-Day Care/ DKLC” and “Alay Pasko” have been regular programs of the University that reach out to the DKLC. The Center has planned several activities for November 18-23, 2018 to celebrate its 20th year. Part of the plans is to invite its graduates. The Center is located near the Elementary Principal’s Office. For inquiries, please contact the DKLC head at mariadinkylim@yahoo.com or call the Principal’s Office at (078) 844-1822 local 208.